Kathy Arnold, St. Ignace store manager, has been serving our fudge lovers for 31 years. 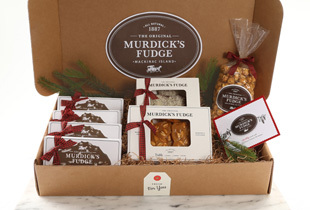 Visit Original Murdick’s Fudge Location In Michigan’s Awesome Upper Peninsula! 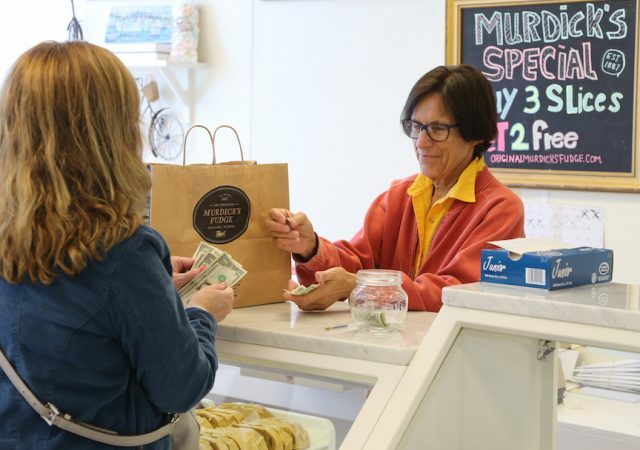 Our St. Ignace fudge shop manager, Kathy Arnold, has developed personal relationships with lots of our customers during her 31 years with Original Murdick’s Fudge. 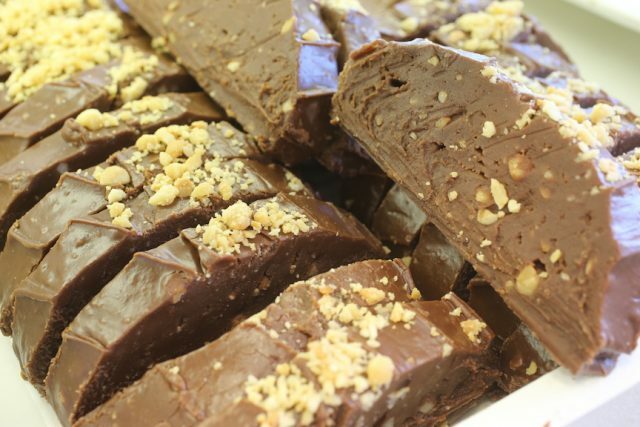 “Regulars come in all the time and say we thought you were retiring years ago,” our long-time fudge expert says with a laugh. The shop originally was a hardware store where her father-in-law once worked. 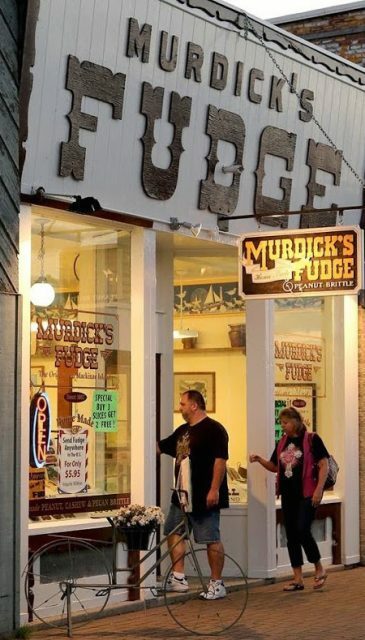 It became our Original Murdick’s Fudge downtown St. Ignace location in the early 1970s. 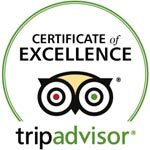 “My favorite thing is seeing regular and repeat customers several times a season,” says the longtime St. Ignace resident. Another fun thing is working with her granddaughter, Hayley York, who’s been with Original Murdick’s Fudge in St. Ignace for about five years. 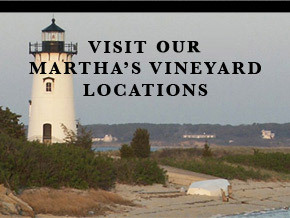 Our downtown St. Ignace shop is located on Main Street near the ferry docks. 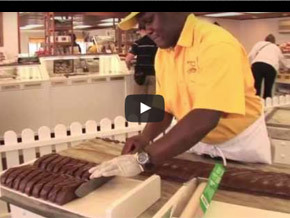 Enjoying a few slices of fudge is a great way to cap a wonderful Straits of Mackinac adventure. 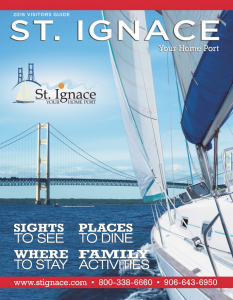 Click on this guide to discover insider information about exploring St. Ignace, one of two gateways to Northern Michigan’s beautiful and historic Mackinac Island. 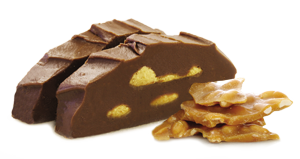 We hope to see you soon at our St. Ignace or Mackinac Island Original Murdick’s Fudge shops.